Workflow of a natural transformation. Providing this basic part, we want to encourage the community of iGEM as well as all other scientists in the field of synthetic biology to start working with V. natriegens. Including tfoX into the modular cloning system of iGEM and the Marburg Collection we hope to usher in a new era of synthetic biology. We would love to see future iGEM teams using this basic part for further constructing their individual transcription unit variants in order to screen for the maximum efficiency for customized applications. 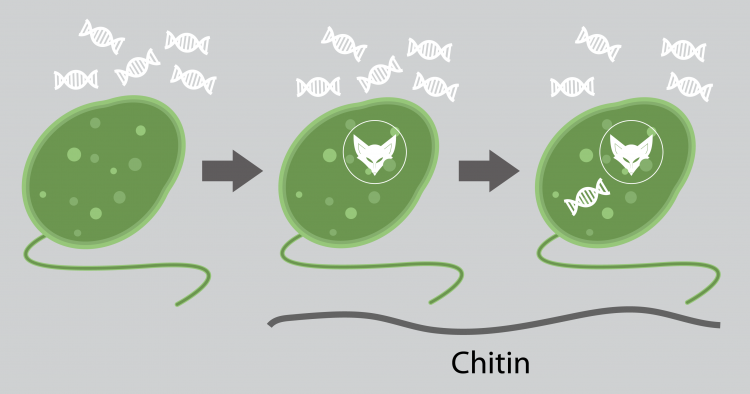 Using tfox in full transcriptional units, we were able to perform natural transformation with plasmids as well as with linear DNA to create our strains with genomic modifications. 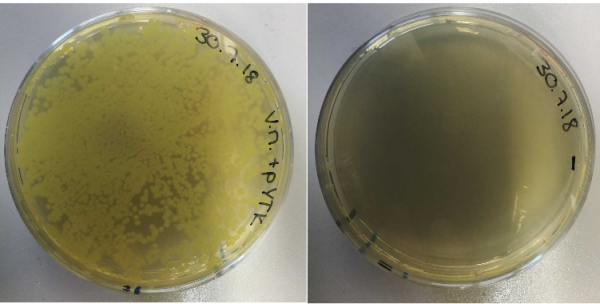 Plates showing the successful transformation of plasmids using natural transformation. Left plate is showingtransformation of cells with pYTK. Right plate is showing negative control..